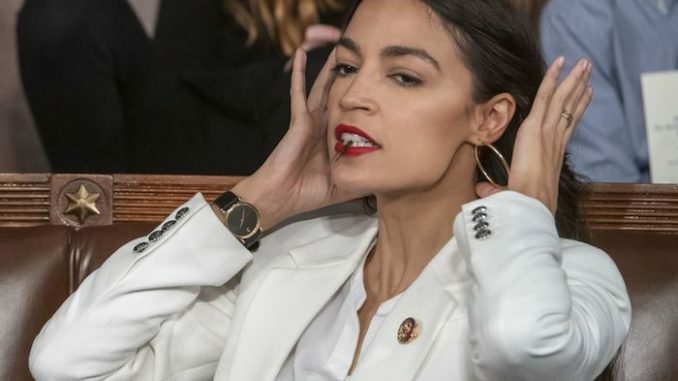 Democratic Rep. Alexandria Ocasio-Cortez says she will introduce a bill to block President Trump’s planned emergency declaration to build a border wall. The 29-year-old socialist says she is working with fellow Democratic Rep. Joaquin Castro to bulldoze Trump’s plans. “If President Trump declares a national emergency to fund his border wall, I’m prepared to introduce a resolution to terminate the President’s emergency declaration under 50 U.S.C. 1622. (National Emergencies Act). “This was not a spontaneous event. It was well-planned. It was well-organized,” Duarte said at an event hosted by the Center for a Free Secure Society at the National Press Club. Breitbart.com reports: He said different intelligence, law enforcement, and military agencies found evidence that the October caravan from Honduras to the U.S. — which at one point contained about 40,000 migrants — was organized in advance. He said the main organization behind the caravans was a non-governmental organization based out of Chicago, called Pueblos Sin Fronteras, led by organizer and pastor Emma Lozano. He said Bartolo Fuentes, a Honduran activist, was the main leader of the caravan on the ground, and that he came into Guatemala beforehand to scout and send money to places migrants could stay as they moved through Guatemala towards Mexico. Duarte said the group also connected with international NGOs like Oxfam. He also gave details of the tactics the caravan used as it pushed into Guatemala. “We had a big, huge contingent of police officers protecting our border. Unfortunately this migrant groups put women, the elderly and children as young as 40 days of age at the front, and started pushing and pressing against our police force,” he said. “We could not even use tear gas … because some of the smoke could hurt the small children,” he said. “It became an unsustainable situation. Children were being pressed against the fence. Some of them were actually were already suffocating because of all the pressure behind them. So we had to retreat our police forces and to allow these migrants to go through our border,” he said. Duarte said Guatemala heeded the United States’ call to try to stop the caravan from reaching the U.S. border. He said they set up 12 different roadblocks on the way to Mexico, to delay the migrants. “Through that work, we also identified a total of ten operational leaders with the caravan,” he said. Duarte said they also identified more than 100 migrants from the Middle East traveling in the caravan — a claim President Trump had alluded to in an October 22 tweet. “We also intercepted a total of 126 special interest aliens during these caravans, special interest aliens from countries and with probable links to Islamic extremists,” Duarte said. Duarte warned that another big group of migrants coming from different countries in Africa, Asia and the Middle East, and from Cuba, is headed to the U.S.
“Their intent is to make a 30,000 strong caravan to go all the way up through Central America, Mexico, and come to the U.S. open border,” he said. Duarte assessed that the migrants traveling in the caravans were being used as pawns as a way to destabilize the U.S. and partners in the region. “This new way of doing politics, which is how we are actually analyzing this, we are calling it, and we are using this term, now it’s weaponization of those in need,” he said. He did not blame the migrants, who he said were in search of economic opportunities, or trying to escape conflict, persecution, terrorism, human rights violations, and other things. “As human beings and societies, we cannot ignore … difficulties other face in life,” he said. 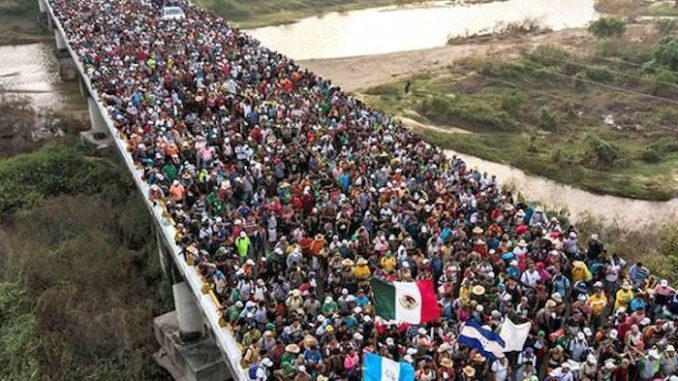 “Unfortunately cruel heartless manipulative political actors and radicals have taken advantage of those in need, and are utilizing them now as lethal weapons of invasion of political influence, and as their own private parties of picketing mobs. That’s what this is,” he said.